THE year 2018 was a challenging one on the labour front. Workers were retrenched from two major state enterprises, Petrotrin and TSTT. There were also differences of opinion between the business community and the labour movement. Here are some of the stories which made the news in 2018. In August, Petrotrin announced that its Pointe-a-Pierre refinery and marketing unit would be shut down within the coming months. The refinery was closed on November 30. At the time, the company said 1,700 temporary and permanent refinery workers would lose their jobs in about two months, while another 800 will be kept on as part of a redesigned exploration and production unit. The company had a total of 3,500 permanent and 1,500 temporary employees. The Prime Minister defended the decision to close the refinery. In a televised address to the nation in September, Dr Rowley said the Government had no choice but to close the refinery because it had become a drain on the treasury. The PM said closing the refinery was not a decision made lightly, as the effect on workers and their families was considered. He said workers would be treated with dignity. On October 10, Petrotrin got the green light to terminate the 5,000 employees by the end of November, as an Industrial Court-imposed injunction, ruling the termination should be put on hold, had been stayed. On November 30, Energy Minister Franklin Khan said $2.7 billion would be paid out to Petrotrin's workers. The payments comprised $1.8 billion in termination packages; $201 million for outstanding vacation; $150 million for medical and other benefits; and $55 million in payments for outstanding promotions. In a statement in the House of Representatives on December 17, the PM said former Petrotrin employees will be given the opportunity to enter into housing programmes if they wanted to get a house, build a house or find a piece of land. Rowley also said lands would be made available to former workers who may have an interest in agriculture. On December 19, he met with a delegation from the Oilfield Workers Trade Union (OWTU), led by its president Ancel Roget. On September 5, Nu-Iron Unlimited withdrew its US$20 million bid for the former Arcelor Mittal steel plant because of bureaucratic hold-ups. The plant, in the Point Lisas Industrial Port Development Corporation, had been closed in March 2016 and put in liquidation. The liquidator, Christopher Kelshall, declined to confirm or deny the news. He had previously admitted to the Newsday that the bid had been held up because the government agencies handling approvals had been putting Nu-Iron "through the wringer." In April, Macarri Steel Holdings Ltd made a US$27 million bid for the plant, but had not been entertained since the official bid period had already closed. One of Macarri’s directors, TT businessman Unanan Persad, said Macarri is now hoping it gets to bid again, creating employment for former workers, some of whom have been unemployed since the Arcelor plant closed. On September 12, Trinidad Cement Ltd (TCL) fired 16 workers. In a statement, TCL said the rationalisation of manpower was an ongoing effort to streamline its operations towards competitiveness and sustainability. OWTU branch president at TCL Ahmad Mohammed said he saw this as a union-busting move. The labour movement and the business community had differing opinions about the Industrial Court. In a statement in October, the TT Chamber of Industry and Commerce said the current “broken” industrial relations climate is driving away much-needed investment, The Chamber also said pro-labour rulings by the court had not improved quality of life in the country, as was intended. OWTU chief education and research officer Ozzi Warwick countered, "It would be a grave mistake to believe that with the absence of trade unions or even the Industrial Court that workers will simply conform and accept injustice and exploitation. There is a real risk that the country will be plunged into a period of unprecedented instability." In September, Industrial Court president Deborah Thomas-Felix again sought to dispel the claim that the court is biased against employers. Thomas-Felix provided statistics from as far back as 2011, to dismiss the suggestion it is anti-employer. Of the total number of cases disposed of over the period 2011-2015 - 2,744; 27 per cent (or 747) were from judgements in the adversarial process. Of those 747 cases, 30 per cent were in favour of employers. For non-adversarial cases, 15.6 per cent (or 427 cases) were disposed by conciliation; 19.6 per cent (or 539 cases) were settled by the parties and 24.9 per cent (or 683 cases) were withdrawn. Of the cases withdrawn in that period, 330 (or 35.4 per cent) were withdrawn by unions and the court dismissed 23 cases filed by unions on behalf of workers, in 2018. "In short, those outcomes were in the employers’ favour. These are not outcomes that are widely repeated, although they reflect the reality of the work of the court," she said. On November 15, the TSTT retrenched over 500 senior and junior staffers. They received letters saying they had been made redundant, as the company "transforms to survive." TSTT’s CEO Dr Ronald Walcott said the company recorded an operating loss of $32.5 million in the previous financial year, "and the contributing factors that led to that performance continued in the six months of the current financial year to September 2018,” when the company recorded a loss of $478.8 million. TSTT’s financial year runs from April to March. 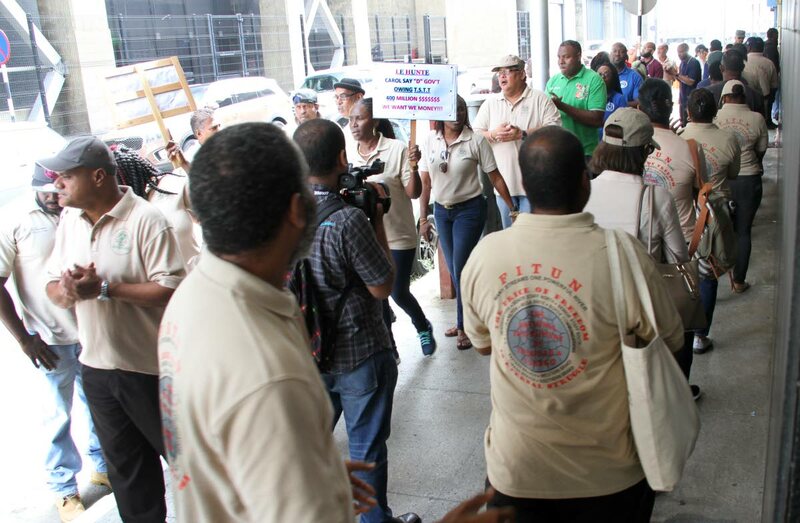 On December 12, TSTT fired an additional 51 workers. Company executives were amongst this group. who were retrenched. On December 14, Communications Workers Union (CWU) general secretary Clyde Elder said the CWU would challenge TSTT's decision to fire the 503 workers in the Industrial Court, and said the union hopes these workers will be either be reinstated or compensated for loss of employment. In the midst of all the uncertainty on the labour front, Labour Minister Jennifer Baptiste-Primus said she empathised with people who have lost their jobs through “redundancy, insolvency or receivership." Criticisms had been made against Baptiste-Primus for remaining silent while workers were being retrenched. But Baptiste-Primus said contrary to what may be the public perception, her record of allegiance to the philosophy of trade union representation as an integral component of democracy in TT "needs no reaffirmation." Reply to "Challenging year for labour"